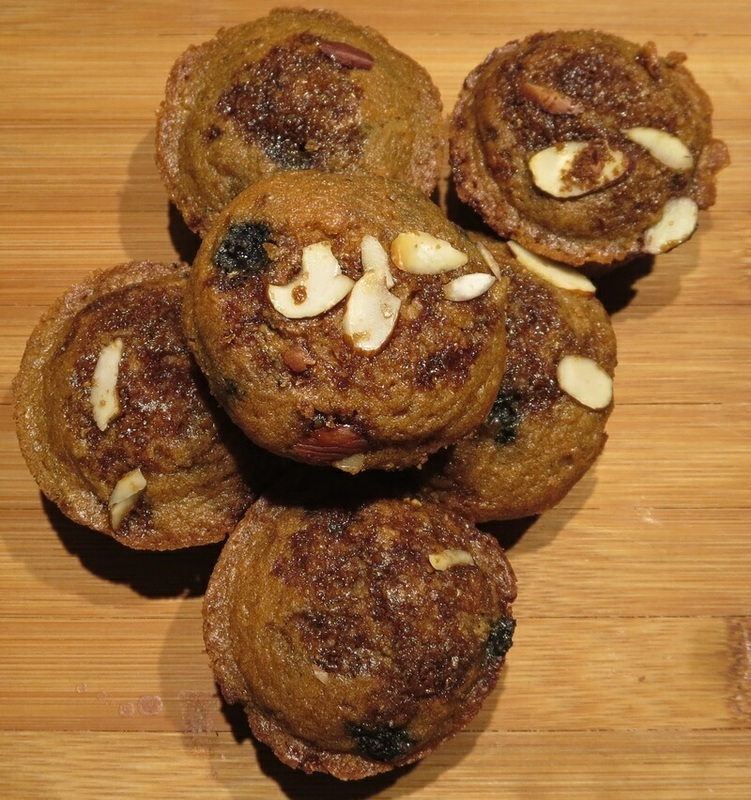 This is hands-down the best Paleo muffin recipe I have every tried – thanks to the baking experts at America’s Test Kitchen. I usually modify recipes, but not this one. This recipe makes 12 standard muffins or about 36 miniature muffins. Benefits: a low sugar treat for Sunday brunch, school lunchboxes or an evening dessert – because sometimes we just need a treat we can feel good about. Adjust oven rack to middle position and heat oven to 325 degrees. Grease 12-cup muffin tin. Combine almonds, 2 T coconut sugar, and lemon zest in bowl; set aside. Using stand mixer fitted with whisk, ship arrowroot flour, eggs, water, melted coconut oil, vanilla, salt, remaining 2/3 cup coconut sugar, and lemon juice together on medium speed until thoroughly combined, about 1 minute. Let mixture rest in mixer bowl for 30 minutes. Whisk almond flour, coconut flour, baking soda, cream of tartar, and nutmeg together in bowl. With mixer set to low speed, add flour mixture and mix until incorporated, about 30 seconds. Increase speed to high and whip batter until light and fluffy, about 1 minute, scraping down sides of bowl as needed. Using rubber spatula, fold in blueberries. Divide batter evenly among prepared muffin cups (cups will be filled to top) and sprinkle with almond mixture. Bake until muffins are golden brown and toothpick inserted in center comes out clean, about 25 minutes, rotating muffin tin halfway through baking. Let muffins cool in muffin tin for 10 minutes, then transfer to wire rack and let cool for 15 minutes before serving. (Muffins are best eaten warm on day they are made, but they can be cooled and immediately transferred to zipper-lock bag and stored at room temperature for up to 1 day. To serve, warm in 300-degree oven for 10 minutes. Muffins can also be wrapped individually in plastic wrap, transferred to zipper-lock bag, and frozen for up to 3 weeks. To serve, remove plastic and microwave muffin for 20 to 30 seconds, then warmed in 350-degree oven for 10 minutes. Note: option to make 36 miniature muffins; grease muffin tins well and bake for 12-14 minutes until an toothpick inserted in the middle comes out clean. Follow remaining directions as above.